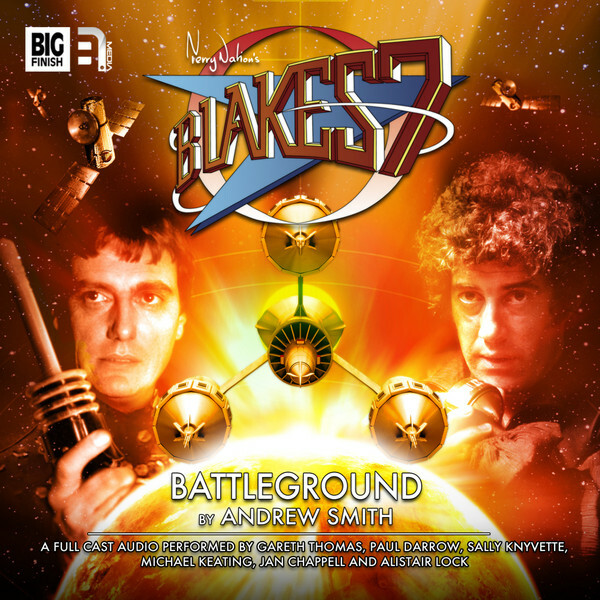 Big Finish: BLAKE'S 7, 1.2 – BATTLEGROUND Review | Warped Factor - Words in the Key of Geek. It’s OK – Tony didn’t need those fingernails anyway. At the end of the first episode in the Blake’s 7 full-cast audio series from Big Finish, there was quite a juicy carrot dangled in front of listeners. Dangled at some length, in fact. The idea was that the race would now be on to catch up with someone named Mikolov, who may or may not have been integral in the Federation’s development of a kind of clone Orac, a machine capable of gathering data from and interacting with any other computer remotely. In some ways, this was the audio series bounding over the advantage that Orac had brought to Blake and his team, threatening to equalise the odds and make the battle of Blake versus the Federation a fairer fight again. The on-screen show never really did that in four seasons – even the shift from the Liberator to Scorpio never made Blake’s 7 that vulnerable, but the audio series, while nowhere near as far forward in time as the Scorpio shift, isn’t afraid to put that equalising step out there almost immediately. That’s a mark of Big Finish feeling comfortable in its 21st century ownership of the right to tell innovative stories within the Blake’s 7 universe. If you’re going to do it, go big, go bold or take your die-cast Liberator model and go home is clearly the mantra here. In Andrew Smith’s script for episode 1.2, Battleground, we spool on from the revelation of that idea of chasing Mikolov to find the crew having already systematically gone through all the living Mikolovs in Federation space – except one. The last one. They track a reference to the name to the planet Straxis, which allows Smith to have one chunk of enormous fun – to force the Liberator dream team of Blake and Avon to beam down into the heaviest concentration of Federation troopers they’ve ever faced at one time – because after all, if you don’t have to pay for physical actors, you can have thousands of troopers on the screen of the mind for relatively little cost. There’s a truism about audio being the most visual medium, and it comes into its own with this sort of storytelling. Straxis is a battleground planet – a place where rebels and prisoners are brought to raise their petty insurrections for the sake of survival, so that Federation troopers and officers can hone their tactics in real battle situations. There are no simulations on Straxis, the objective of war games are to kill real criminals and dissidents. Examine that idea for anything more than a moment and it’ll nauseate you, but it’s the first real sense we’ve had in the audio adventures of the naked truth of the Federation – its ruthless efficiency and use of human ‘resources’ resonating loud and clear from many an on-screen episode. The fanboy understanding of the very flesh and bones of the Federation is strong in Smith’s writing here. We join the action in the middle of Battleground 9, a particularly rowdy area, where a brand new tactical assessment is beginning on Voss Ferrell, a Federation officer sent for re-training after taking unnecessary, bloody risks. With a description like that and a planet named ‘Straxis,’ it shouldn’t come as any surprise to find that Ferrell is played by the 21st century’s Sontaran of choice, Dan Starkey. In some of his more histrionic moments, and Ferrell has many histrionic moments, it’s unavoidable that you’ll hear the Strax in Starkey’s performance, but there’s a foulness in Ferrell’s attitudes which goes beyond simple Sontaran brutality – there’s snobbery there, and class prejudice, entitlement and misogyny, all of which he feels within his rights to vent on his assessor, one Alexa Mikolov (Abigail Hollick). It’s as complex and layered a personality as you’d expect from Andrew Smith, and Starkey for the most part delivers on that complexity. When Blake and Avon beam down – the others, incidentally have their hands full with a satellite network that rips a hole in the Liberator’s force wall like a blaster through butter – they are swiftly separated, Avon being captured by Ferrell’s troops, and so quickly getting to talk to both Ferrell and Mikolov, while Blake, ever the crusader, runs into Abel Garmon, a former Federation high-up, now left in Battleground 9 to fight and die after a show trial for sedition. The separation of the crew allows Smith to craft both sides of the battle, Avon worming his way into Mikolov’s mind and helping to show up the increasing instability of Ferrell, who comes across more and more as the episode goes on as a kind of spoiled brat of privileged parents, while Blake and Garmon make plans to attack the super-tank on which Ferrell is posted – with Avon still inside it – as a kind of first united strike. What we learn of the Federation’s new super-computer is perhaps worth less than the risk of getting it, but the tense action, with Blake, Garmon and a bunch of rebels sent to act as cannon-fodder on the one side, and the class warfare between Ferrell and Mikolov (whose parents were common D-grade stock), is pulse-pounding stuff, with Avon the iceberg in the middle, stirring things up, while Liberator is forced to run the satellite blockade to get its people – and maybe Garmon’s group too - out before the rest of the Battlegrounds realise what’s happening and turn their attention to the rebellion in Battleground 9. Smith’s no stranger to crafting nail-biting standoffs, or to delivering both sides of a scenario with equal compulsion, and Battleground is no different. While being, in Liberator terms, firmly Blake and Avon’s show, he gives moments of glory to both Vila (who saves all their lives, believe it or not) and Jenna (showing off the ship-handling skills she perfected in her smuggling days), and intercuts between sides on the ground and the drama on the Liberator to allow only the tiniest of oxygenating breaths as we go along, while keeping his foot on the gas pedal to push the plot right down to the wire. In fact, like many on-screen Blake’s 7 adventures, Smith jussssst about manages to get the Liberator out of the range of destruction at the last minute, with little left for banter or congratulation – there’s very much a sense of this being the first half of a two-part story arc, even though the drivers for the next part will be entirely different. If the tone of the first episode, Fractures, was pretty Tanith Lee, all disembodied voices and games of mistrust, Smith conjures something much more in the Chris Boucher vein for this second episode, as though he’s slammed the character drama of Weapon into the race against time of the Orac episode itself, updated the brutality of the Federation and filled the screen, and the world beyond it, with Federation troopers whose only thought is to destroy our heroes and win favourable training ratings. Having found Mikolov and been disappointed by what she knew, the hunt is now on for ‘Federac,’ literally the Federation’s Orac. It’s a hunt that sounds as though it carries straight over into 1.3, Drones. So, given that the early Blake’s 7 audios are now available for just £5 apiece, go get them both together and while you’re there, make sure you invest in a seat with a comfortable, well-padded edge – you’re going to be sitting there for a nerve-shredding, bravely confrontational, full-tilt action-packed hour.